Archdeacon Neve was rector of Emmanuel, Greenwood from 1888-1905 and he was renowned for his outreach ministry to the people of the Blue Ridge Mountains. Read more about Neve and Emmanuel on our main history page. “Pray without ceasing. Desire to be a thousand times more useful than ever before.” On January 1, 1917, the Reverend Frederick W. Neve wrote those words in his diary. ​Rev. Neal Goldsborough discovered this silent color film in 1983 as the Diocese of Virginia was dismantling its library in Richmond. This 11 minute film begins with the ordination of the Rev. J. Winfree Smith to the priesthood at 10:30 a.m. at St. Paul's Ivy on Wednesday, May 31, 1939. Other locations in the film include: McIlhany Parish- Grace Church, Red Hill and Good Shepherd Chapel, Hickory Hill as well as St. George's Mission, Pine Grove Hollow. Notes provided by Rev. Neal Goldsborough for the film presentation at Adult Forum on October 7, 2018. The Rev. J. Winfree Smith (June 23, 1914-January 14, 1991). 1938 graduate of Virginia Theological Seminary. Served as rector, St. Paul's Ivy while finishing his Ph.D. in philosophy at the University of Virginia. He taught Greek, French, English, Mathematics and Science at St. John's College, Annapolis MD from 1941-1984. Archdeacon Frederick William Neve (December 8, 1855-November 16, 1948). Archdeacon of the Blue Ridge and missionary. Rector of Emmanuel Greenwood 1888-1905. He is buried under a large celtic cross at St. Paul's Ivy. The Rt. Rev. Wiley Roy Mason (1878-1967). Rector of Christ Church, Charlottesville. Successor to Neve as Archdeacon of the Blue Ridge. Suffragan Bishop of Virginia 1942-1950. The Rt. Rev Fredericks Deane Goodwin (November 5, 1885-January 13, 1968). Bishop Coadjutor of Virginia 1930. Bishop 1944-1960. Officiating at the ordination. The Rt. Rev David Henry Lewis, Jr. (August 5, 1918-May 15, 2002). Suffragan Bishop of Virginia 1980-1987. He is in the film as a seminarian. He graduated from Virginia Theological Seminary in 1941. He is buried at St. Paul's Ivy. Deaconess Mary Sands Hutton (February 20, 1904-July 10, 1985). She is in a wheelchair in the film. She had polio as a child and endured twenty-seven operations. She went to work with Neve around 1930 and served twenty years in mountain mission work. The Rev. Dudley Archer Boogher (March 3, 1905-November 29, 1975). Missionary and Rector of St. Paul's Ivy. His is buried at St. Paul's Ivy. Below is a blog post sharing the grant from Emmanuel that enabled the special collections library to digitize Our Mountain Work in the Diocese of Virginia. 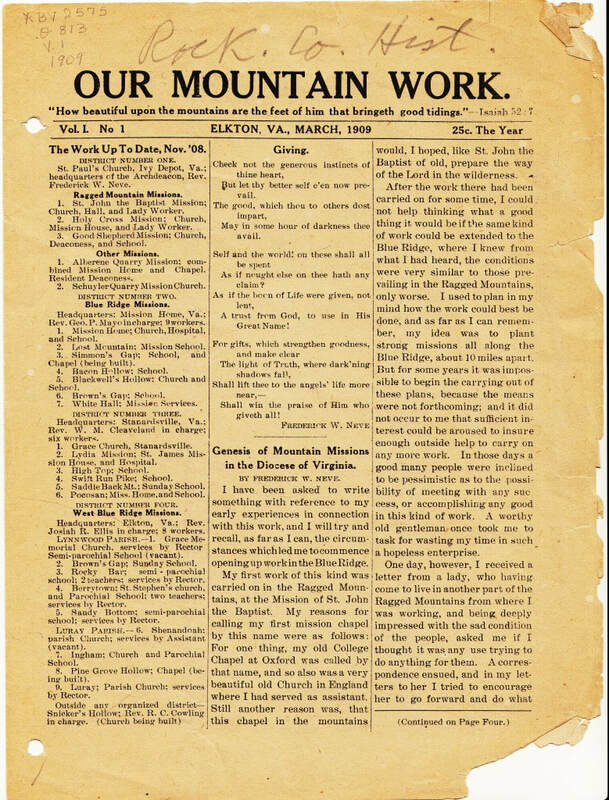 Published from 1909 to 1954 by the Board of Missions of the Diocese of Virginia, this periodical documents the founding of Episcopal mission churches and schools in the Ragged and Blue Ridge Mountains of Central Virginia by Frederick Neve, Archdeacon of the Blue Ridge. or find the collection through this link.